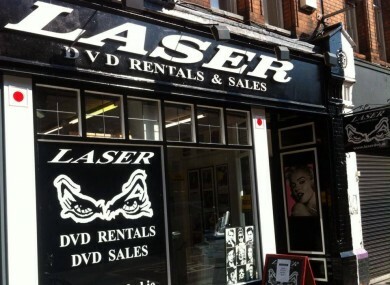 Dublin’s Laser DVD is closing down. ONE OF DUBLIN’S most well known stores for picking up classic films, world cinema and some indie surprises is to close its doors after 25 years. Laser DVD has been located on George’s Street for the past 22 years having been in Ranelagh for a number of years before that. But the decline in the movie rental market and the rise of online streaming and downloads has meant that the store is now in the process of selling off its library before shutting up shop. The store let its followers know of the news this afternoon, saying that they would like to thank customers for their support. The store currently employs nine people with one of their longer serving staff members Peter saying that they’ve tried to fill a niche that’s been declining in recent years. He adds that while many of the other larger rental stores like Xtra-Vision have diversified in recent years into areas like video games and mobile phones, it was never really what Laser DVD was about. The store is planning on remaining open for the next few weeks. They will not be offering a rental service but will begin the process of selling off their library of films. Email “Film lovers, you've one less place to go to find classic movies”. Feedback on “Film lovers, you've one less place to go to find classic movies”.